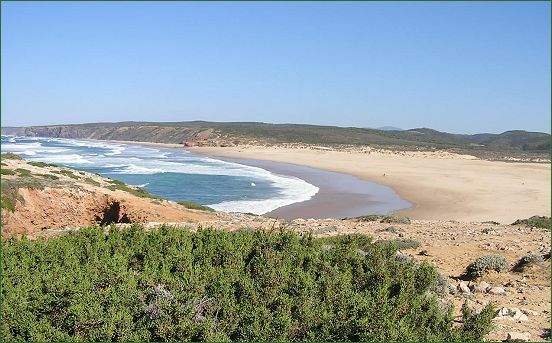 This is the fantastic kilometer long beach of Carrapateira, a charming little village between Aljezur and Sagres. Well known for lovers of nature for its unique landscape with wide strips of dunes behind the beach. Walking through them one feels like in the desert. But also well known for surfing. Well known is also the very close next beach of Amado, a paradise for surfers. In Carrapateira there are three surf scools and camps. Two surfshops, three cafes, 5 very good restaurants, a bakery, a small grocery store, a market where you can buy daily fresh fish, fruits, vegetables, meat and bread. Banks, a post office and pharmacies one can find in one of the near bigger villages Lagos, Aljezur and Vila do Bispo. The famous golf courses on the southcoast are about 15 to 30 minutes by car away.